I recently wrote a post about pruning roses. But what about the rest of the plant material in your garden? 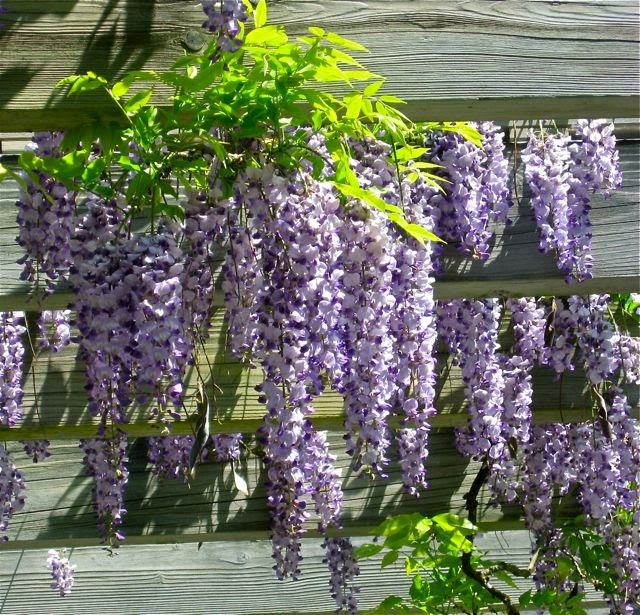 When is the optimal time to prune those plants? The right time to prune depends on the plant. Here are some general guidelines. Fruit trees - note that these are pruned very differently from ornamental trees to maximize fruiting spurs. Be sure to consult a pruning guide before proceeding. Winter is also a good time to prune conifers (pine, fir, cedar) to minimize sap "bleeding." Rhododendrons - these and many other plants start setting flower buds shortly after the current flowers fade, so don't dilly dally. If your rhododendron needs shaping, get to it right after bloom so the plant has time to set flower buds for the coming year. For the most part, summer pruning is a matter of deadheading and light trimming. Some people give their Japanese maples a bit of a hair cut in summer, because they get so twiggy, but that's optional. Avoid this practice. I know many people were raised in households where pruning trees and shrubs was part of fall cleanup and preparation for winter, but it is not a good horticultural practice. All pruning stimulates growth and new growth is very susceptible to cold damage. If a plant is exposed to a sudden, early freeze, as we've had in Seattle the past three or four years, the new growth may be killed and the overall health of the plant jeopardized. Remove dead, broken or damaged branches any time of year. These are very basic guidelines. For more specifics I refer you to the American Horticultural Society's book, Pruning and Training and Cass Turnbull's Guide to Pruning . Be sure you have proper tools, and if you are handling roses or berries, a pair of thorn resistant gloves . To prune properly, you need very sharp tools so that you can make clean, precise cuts. This is important because jagged cuts and torn bark provide good avenues for insect infestation and disease. To do the job well, you don't need lots of tools, you just need good ones. 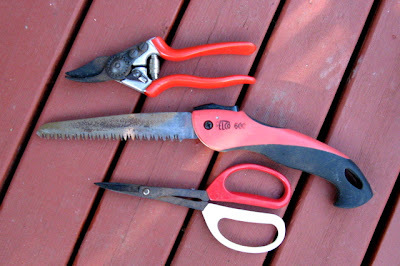 Here are my well-used favorites, the tools I use for 95% of the pruning I do. At top, my 19 year old hand pruners, a folding saw and a pair of bonsai scissors. Hand pruners . Unless you are doing significant tree work, most of the pruning you'll do is with hand pruners. It is worth it to spend a little extra money on pruners that feel good in your hand and are sturdy enough to last. Felco is the brand I prefer because they offer high quality and a choice of sizes and features. The pair I have is designed for small hands like mine. I no longer get cramps from trying to use pruners that are too big for me. Felcos come in larger sizes, of course, and there's a version for left-handed gardeners , too. All of these are bypass pruners, which are preferable to anvil pruners because they make cleaner cuts. Anvil types tend to crush stems, especially as they lose their sharpness. Folding pruning saw . I like folding saws because you can fold them up and slip them into a pocket (or a tool holster ) to keep them handy. They are small and easier to maneuver in cramped spaces than larger saws. These saws are fine for cutting branches up to 2-1/2" - 3" diameter. Better brands have blades that can be replaced. Bonsai scissors . When I bought these scissors 15+ years ago, I didn't think they would be as useful as they have turned out to be. They are ideal for tip pruning shrubs and roses. I use them to deadhead pretty much everything, including bloomed-out herbs like lavender and thyme. They are the perfect tool for deadheading rhododendrons because the pointy blades can slip into the tight space at the base of the faded flower without damaging the new growth emerging below it. OK, those are the "must haves" -- now here's a few tools that you might need for specific situations. If you are a beginning gardener, add these as you come across a project they are suited for. There's no need to spend money on them until that time. None of these are precise tools. The length of the handles of loppers and pole pruners can make for wobbly cuts. The bow saw is hard to maneuver in tight places. You use these in cases where you want to remove lots of foliage and branches quickly so you can get to the specific areas where you will make precise cuts with smaller tools. Loppers are excellent for projects like clearing out blackberry overgrowth or dismantling shrubs you want to remove. They are also good for "lopping" off big hunks of foliage and get them out of the way so you can get to the place along the trunk where you need to cut off a branch. Bow saw . Bow saws are best used to make quick work of large diameter branches. They can be a bit unwieldy because of their size and shape, which can make for irregular cuts. Good for clearing away storm debris or removing trunks and branches of trees you want to remove. Pole pruner . Again, these are tools that have some use if you need to remove the outer portions of broken branches. But it really isn't possible to have precise control over a cut made holding a tool with such a long handle - there's going to be some wobbling going on. That said, there are places where ladder work is not practical (slopes, e.g.) and these pruners might be the best or only choice. There you have it, the lowdown on pruning tools. There's just one more thing to add -- good information on how to prune. If you live in the Seattle area, consider getting some hands-on training from Plant Amnesty. Check their website to find out when and where classes are being held. Or get a copy of Cass Turnbull's pruning guide, which is the next best thing. Cass is the founder of Plant Amnesty. Ask rosarians around here and you will find out that February is the month to prune roses. Exactly when in February is a matter of opinion. Some people do their pruning around the first of the month. Others wait for Valentine's Day or Presidents Day. Others won't touch their roses until the last days of the month. Why does it matter? Pruning stimulates growth. Plants respond to being cut back by releasing growth hormones and new shoots follow soon after. This new growth is tender and very susceptible to cold damage. A late, hard freeze will kill the new growth and possibly the entire plant. Therefore, you want to hold off until you are reasonably sure the danger of a freeze is past. Beyond the question of when to prune roses, there's the question of how. The answer is complicated because there are several different types of roses and they are pruned in different ways. 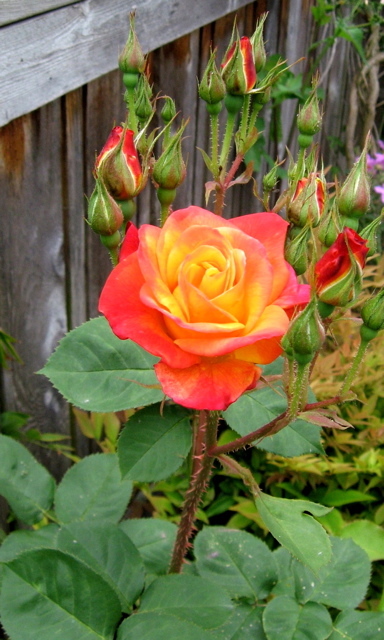 Hybrid tea roses are cut back to about 18", shrub roses are pruned to shape them and climbers are pruned primarily to train them onto a structure. Rejuvenating old roses requires yet another technique. As always, I refer you to the book, Pruning and Training , for specific directions. If you live in the Seattle area and want hands-on instruction, consider attending Plant Amnesty's rose pruning class on February 13. The cost is a reasonable $15 for non-members (less for Plant Amnesty members and horticulture students). You'll learn the proper way to prune your roses and have a chance to ask questions before trying this at home. Keep in mind that rose pruning varies considerably from region to region. What works in the unique climate of the Northwest is not applicable to other parts of the country (or world for that matter). If you live outside the Puget Sound region, check with your local horticulture professionals for advice.